We are excited to announce our partnership with leading stakeholders from the snow industry to use our recyclable resin system ReRez -powered by Connora Technologies-, in order to inspire change. PARK CITY, Utah – January 24, 2016 – With the goal of inspiring others to reduce their environmental impact, Shred is proud to debut a goggle that uses reclaimed, recycled, and organic materials. And thanks to partnerships with Connora Technologies, The CAPiTA Mothership, and Protect Our Winters, this new goggle–the Simplify Natural–features content recycled from the snowboard manufacturing process. This collaboration marks the first time that multiple companies in the snow sports industry have teamed up to provide manufacturing scraps with a new life. The goggle showcases a rig, pins, and adjuster made from epoxy resin that is reclaimed and recycled from The CAPiTA Mothership production facility. Recognized as a leader in environmentally responsible manufacturing, The Mothership is 100% hydro-powered and relies heavily on locally-sourced materials. The Mothership will be using a new resin, ReRez™, to produce select boards. Developed by Connora Technologies, ReRez’s innovative formulation allows flashing waste to be recycled rather than discarded in a landfill. In addition to its rig, pins, and adjuster, the Simplify Natural features a slew of materials that try to reduce impacts on the environment as much as possible. The goggle sports a frame that uses 30% recycled content, a strap made with 100% organic cotton, and face foam created with responsibly-sourced Merino wool fleece. The accompanying goggle bag is made with 100% recycled plastic derived from water bottles while the goggle box is made with 80% recycled paper and has a recyclable PET window. And to ensure it offers exceptional performance, the Simplify Natural also features the brand’s signature technology, ShredWide™. This lens and frame design enables riders to see more of what is ahead and around them for unrivaled peripheral vision. Shred and Slytech empower athletes to push their limits–and simply have fun. 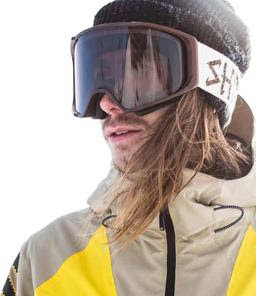 Founded in 2006, the brands create eyewear and protective equipment for dedicated skiers, snowboarders, and mountain bikers. By blending sophisticated materials, fresh technology, and exceptional engineering, Shred and Slytech have earned the trust of these athletes and emerged as quiet leaders. Guided by a love for the mountains and a commitment to innovation, the brands aim to inspire change, reimagining how optics and protective equipment look and perform. Today, Shred and Slytech products are sold and distributed in forty countries and backed by athletes across the globe. To learn more, visit shredoptics.com and slytechprotection.com.